Better yet a microbe that eats chinese Yaaaaa ! Here we have a bacteria that has evolved to consume materials that didn't exist only 100 years ago, and STILL there will be those that deny the process of evolution. The whole "save the planet" movement is BS. People don't really care about saving the planet. People care about saving the PEOPLE. It's all about saving ourselves. The planet has been around for BILLIONS of years (estimated 4.6 billion) while humans have been around for about 6,000. We don't need to save the planet, the planet will be fine. And if the planet is so inclined, it will shake us off like a bunch of fleas. And he's right. Plastic... the one "unsolvable problem" humans have created. We hear about these giant islands of plastic debris floating around, and how it'll never break down and what not... but here we go, Mother Nature has already found a way, and is taking care of the problem for us. One day we'll realize, and thank her. Here's a little math, for comparison, because people tend to lose sight of the sheer size of numbers once they pass a certain point. Hopefully this helps. Further, one human life represents about 1.3% of the entire human history. If you got 77 people together, their combined lifespans is equivelant to the entire duration our species has existed. The same comparison of human existance to earths existance gives you a number around 76,666,666. You need 76 million times the entire human existance to total the age of the earth. The human race is less substatial and bothersome to the earth, as that mosquito bite is to you. You forgot to mention the part about human's being a plague on the earth. I don't think we'll last even as long as the dinosaurs. And good riddance! Bob, all well put.. except human history is much more than 6000 years. newest evidence shows possibly 400,000 years. Uutra-violet light breaks down plastic. Exposure to direct sunlight helps speed up the process. Plastics never actually 'decompose', they merely break down into smaller and smaller pieces. Being an inorganic material, in never will compost. if you honestly think that plastic doesn't decompose, maybe you should pay attention to the news. decomposition of matter is the act of some form of bacteria eating it and changing its form while excreting the waste material. decomposition of wood is accomplished by fungi and a lot of other organisms. leaves and other stuff is decomposed in similar ways. plastic bags aren't decomposed as fast as what you'd like but they DO decompose in the same manner. check out this web site "http://www.theregister.co.uk/2008/06/11/anton_wylie_phages/" and you'll see that the solution was found by a 16 year old child in Canada. the bacteria couldn't consume anything else so it started to consume plastic and was living off it. I think it odd that Deniers really do not understand the 'green' movement is really about self preservation and survival. Which is what we humans are all about. bacteria are the top dogs, we are some kind of hybrid derivative doomed to soon be extinct. bacteria adapt, we try to make other stuff adapt to us, our famous -"its their fault' syndrome. every time in known history, humans screw around (both ways) it leads to some vast un-natural re-direction of other species evolution. bacteria, being so numerous and very simple (like me) alter their genetic structure to fit the environment. it may be what we call 'crude', but it sure is working! Have you ever burned plastic? It shrivels up to a small size. Just burn it, then send it into outer space, we aren't going up there anyway. Perhaps the aliens will find it and know how to dissolve it. You should try to stop smoking it. Burning large amounts of plastic causes air pollution. This is no solution to this problem. Whatever byproduct they are releasing it must certainly be better than all the trash that is thrown into the ocean. So, when the sea birds feed their plastic to their babies, do they pass on the plastic eating bacteria too? Also, Plastics do not degrade for thousands of years in oceans or on land. it doesn't? 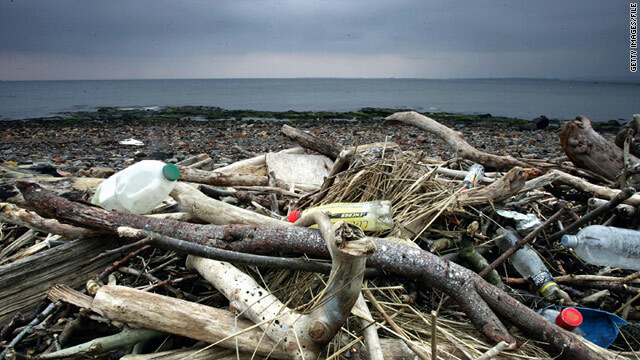 why then do we already see degraded and decomposed plastics in the oceans after only 50 years? How bout we just.. stop using plastic??? Doing dishes isn't fun but i think we'll live. well, the important is..we as a human being should be aware of what's happening in our surrounding and I know you guys there knows that one of our problem is the garbage. It's really rational though that if the population increase, human is affected. We just be thankful that some scientist discover organisms that could help decomposition in a faster way. Maybe..it could help.